FM 167 south from Acton to Pecan Plantation Subdivision. (Necessary to obtain permission from front office to enter). South (left) on Montecello Drive through entire subdivision until reaching Pecan Plantation Fire & EMS. Left (east) on dirt road opposite firestation (private entrance to Leonard Bend Pecan Farm). Follow Road .6 miles. Cemetery is unmarked and impossible to find without the farm foreman. 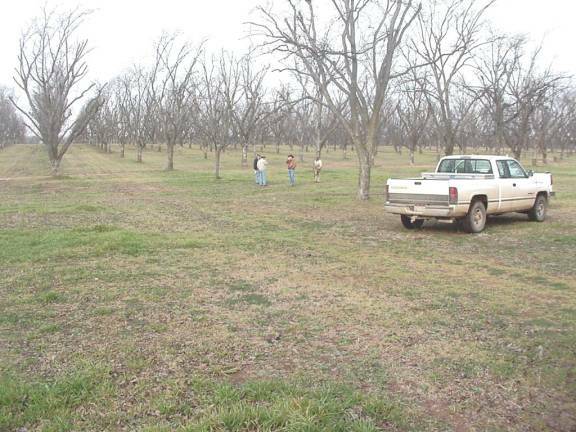 It is located in the pecan grove. The cemetery site is due south from the private dirt road about 100 yards north of the subdvision fenceline. Check in at the farm headquarters before attempting to locate this site because it is on private property. 3297-242. Overall view of location of Kristenstad Cemetery. The missing pecan trees is the main evidence that a cemetery is located here. According to a longtime employee of the Leonard Bend Pecan Farm there was once a battered, illegible, metal funeral home marker and two small graves outlined by marbles - all now vanished. ***See Comments by Gene Berryman. of children being buried but they were not twins and knows of no Rosie Pearl in his family. of further assistance please contact me.